CDF: Wjj bump almost 5 sigma!!! Today at the conference Rencontres de Blois the CDF collaboration presented an update on the invariant mass of 2 jets produced in association with a W boson. 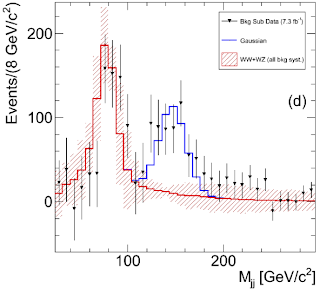 Recall that 2 months ago CDF posted a paper based of 4.3 fb-1 of data claiming that this observable displays an unexpected bump near 150 GeV with a significance of 3.2 sigma. The bump could have been a fluke, an accounted for systematic effect or surprising new physics. Now the first option is no longer on the table: the same bump is also present in the more recent data with a large statistical significance. 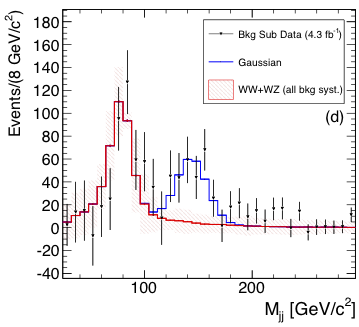 With 7.3fb-1 of the Tevatron data, after subtracting the known Standard Model backgrounds other than the WW and WZ production, the distribution of the jet pair invariant mass looks like this: The peak has become more pronounced! CDF quotes the significance of 4.1 sigma (the number 4.8 sigma I quoted earlier takes into account only statistical uncertainties; after including systematic uncertainties the significance drops to 4.1 sigma). In a collider experiment, such a huge departure from a Standard Model prediction is happening for the first time in the human history :-) I don't have to stress how exciting it is. However we're not celebrating the demise of the Standard Model yet, not before an independent confirmation DZero or from the LHC. In any case, this summer is going to be hot. For possible theoretical explanations of the bump, see my previous badly timed post. In the Blois slides CDF adds one important new piece of information. 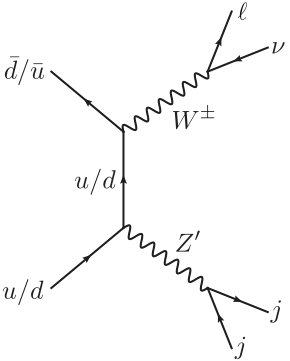 They say the bump cannot be due to the Standard Model top quark background, contrary to what was suggested in a couple of theory paper. 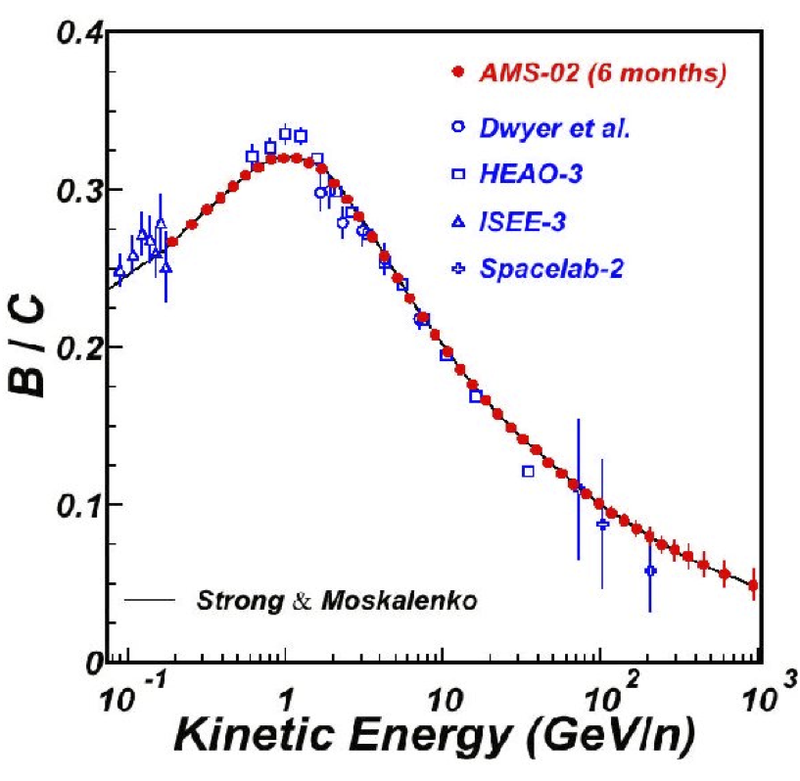 Basically, there is no sign of enhanced b-jet content in the excess events, and in any case the top quark endpoint would show up below 150 GeV due to different jet energy scale corrections for b-jets. Update: CDF has released more plots and the note describing the update. Almost 2 months ago the CDF collaboration published their analysis of the events with exactly 2 jets, 1 lepton, and missing energy. These are vastly dominated by boring Standard Model processes where the W boson is produced together with jets and subsequently decays to an electron or a muon and a neutrino. 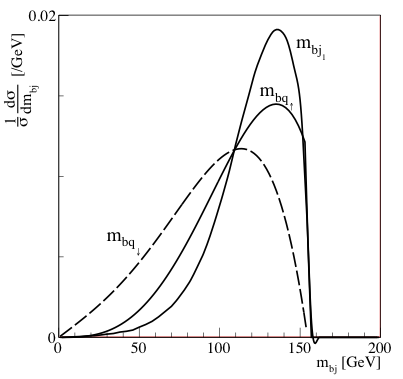 A surprising feature showed up in the distribution of the invariant mass of the jet pairs. After subtracting the Standard Model background, CDF observed a bump near 150 GeV with a significance of 3.2 sigma. Obviously, theorists rushed to interpret the bump in term of physics beyond the standard model. The CDF result hints to a new particle with a mass of around 150 GeV, a significant coupling to the light quarks and a tiny coupling to leptons; the remaining details are left up to our imagination . Here is a selection of the educated guesses that appeared in about 50 papers to date. The first thing that comes to mind is Z' - a new neutral gauge boson coupled to the left-handed quarks. 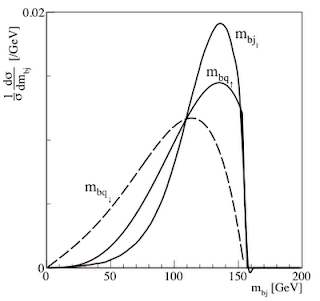 This is a valid possibility provided Z' is leptophobic, that is to say, its coupling to electrons is less than about 0.05 to avoid constraints from the LEP experiment. There is some tension with the constraints from the UA2 experiment that was operating some 30 years before christ and made a search for a narrow Z' in the dijet channel. 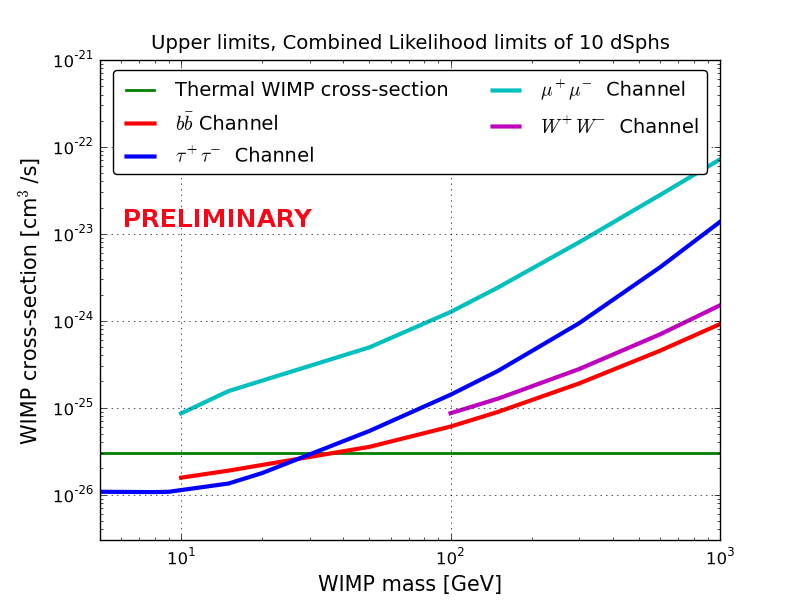 The UA2 limits on the Z'-quark coupling translate to a constraint on the W+Z' cross section at the Tevatron that allows one to explain only about 60 percent of the events observed by CDF. However, given the large uncertainties involved in the CDF measurement and in interpreting the UA2 results, the Z' option remains open. 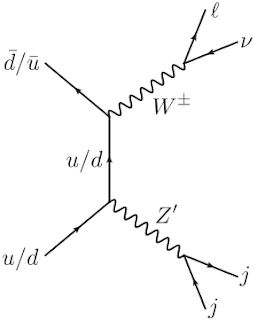 One should also note that nothing in the data tells us the new particle is a vector boson, it could just as well be a scalar. So this is where we stand today. The situation may or may not be clarified when more data arrive. The updates from CDF and D0 are imminent. Someone will call a bluff? Or someone is holding an ace up his sleeve? Stay tuned for the next episode. AMS-02 is up and running, and first events have already been twitted to the Earth. AMS is a full fledged particle detector attached to the ISS whose goal is to measure the cosmic ray spectra. The mission has been plagued by ill fate (delay due to the Columbia crash, scrapping of their superconducting magnet), now the road seems to be clear at last. The final preparations and the launch have been widely reported in the mainstream media, however my impression was that the actual science that AMS may accomplish was not clearly exposed. Here is my understanding of what AMS could teach us. The first point situates somewhere between Sam Ting's fixation and crackpottery. 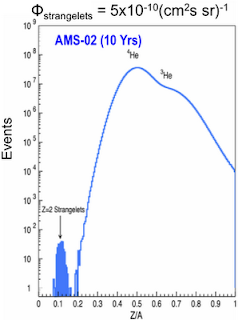 AMS will search for anti-helium nuclei arriving from the outer space. 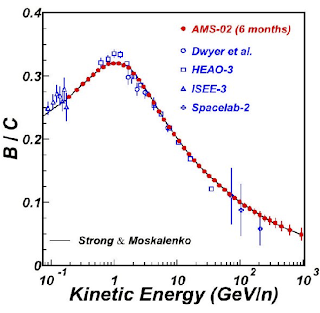 Unlike antiprotons, positrons and anti-deuterium, heavier anti-nuclei are not expected to be produced by cosmic ray collisions; anti-helium would have to be produced by astrophysical objects made of anti-matter. The problem is that we know there is no such thing: all the primordial antimatter annihilated with matter around 1 sec after the big bang. This view is not only the consequence of the current cosmological model, but it is also firmly supported by several independent observations, such as the cosmic gamma-ray spectrum, the cosmic microwave background, and the near perfect agreement between the predictions of nucleosynthesis and the composition of visible matter in the universe. 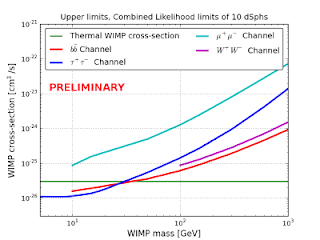 Given the current body of evidence, AMS has a better chance for a 3rd degree encounter than for finding primordial anti-matter. The situation with dark matter is more subtle. The PAMELA and FERMI satellites launched in the previous decade have been providing us with precise measurements of the high energy cosmic ray spectra. One thing we definitely have learnt is that it is painstaking to search for dark matter this way. Several excesses over theoretical predictions have been reported so far: PAMELA's positrons, Fermi's electrons, Fermi's photons from the galactic centre. They all have a plausible interpretation in terms of models of dark matter and an equally plausible interpretation in terms of boring astrophysical phenomena. 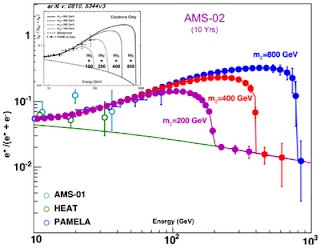 AMS may provide more input regarding the high energy spectra. 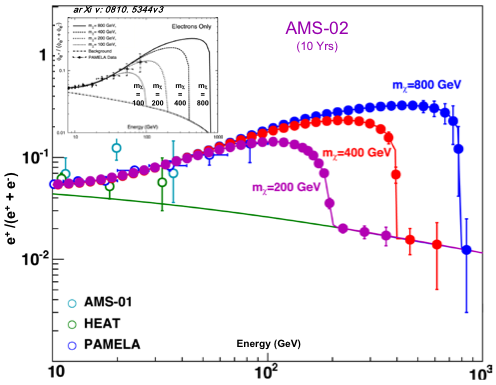 As can seen in the plots of the projected sensitivity, after 10 years of data taking they expect to extend the measurement of the positron and antiproton spectra up to almost TeV (compared to the current reach of PAMELA of about 200 GeV). It's hard to say if these projections are realistic, since it is not clear how much the resolution at high energies is degraded due to the replacement of the superconducting magnet by a weaker permanent one. Assuming they are realistic, particle physicists will be able to refine their models of dark matter, and astrophysicists to refine their models of pulsars. In any case, the chances for a smoking gun signal of dark matter appear slim at this point. Nevertheless, there is one area where AMS is clearly superior to all previous experiments. The instrumentation of AMS includes a calorimeter, trackers, a Cherenkov detector and a time-of-flight detector to measure the energy, charge and mass of incoming particles. All this gives them very good particle identification, in particular they can easily separate heavier nuclei from much more numerous protons and helium nuclei. Flux ratios of various heavy nuclei, for example the boron-to-carbon ratio, are an important input for the models of cosmic ray production and propagation. 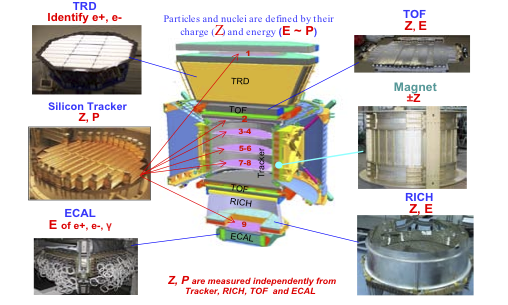 Furthermore, if there exists exotic matter with distinct charge-to-mass ratio, for example the hypothetical strangelets with small Z/A, AMS is well equipped to identify it. 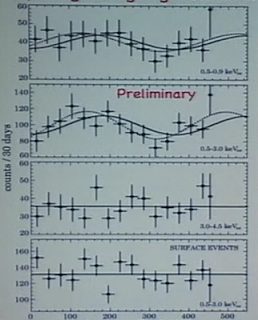 In summary, high energy astrophysics is a crowded field, and AMS is unlikely to turn it upside down. Their best shot for a spectacular discovery is exotic forms of matter with distinct Z/A ratio, provided they exist. Furthermore, if AMS and the ISS last long enough, and if the performance of the detector is as good as they promise, they should be able to extend PAMELA and FERMI measurements of the antiproton and positron spectra to higher energies, which may or may not clarify the origin of the positron and electron excess in PAMELA and Fermi. 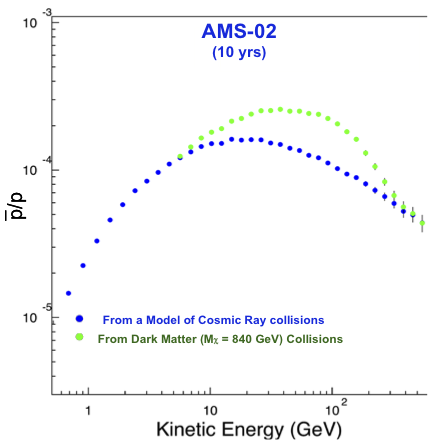 In the worst case AMS will sort out the spectra of heavier cosmic ray nuclei, providing valuable input for cosmic ray propagation model. Critics may complain that 2 billion dollars for tuning GALPROP is a lot. Optimists may stress that so far it's the only hope for returns from the 200 billion dollars sunk into the ISS. Figures are taken from the talk of Andrei Kounine at TeVPA'10. The annual sabbat of the Fermi collaboration took place last week in Rome. 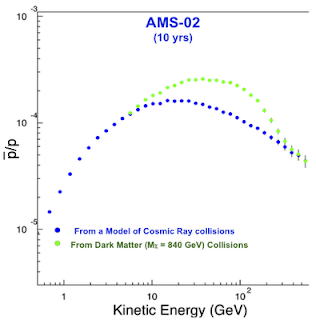 One of the new results presented there was the measurement of the positron fraction in the cosmic rays. This is a very hot observable given PAMELA's claim that the positron fraction at high energies is larger than the one predicted by models of cosmic ray propagation. The PAMELA excess can be interpreted as a signature of dark matter, although boring astrophysical explanations are also possible. But a skeptic could doubt the PAMELA result. Measuring the positron fraction requires discriminating between positrons and much numerous protons; one needs the proton rejection power at the level of 1 in 100 000. PAMELA claims to have that rejection power, but the possibility of an unaccounted for systematic effect did exist. 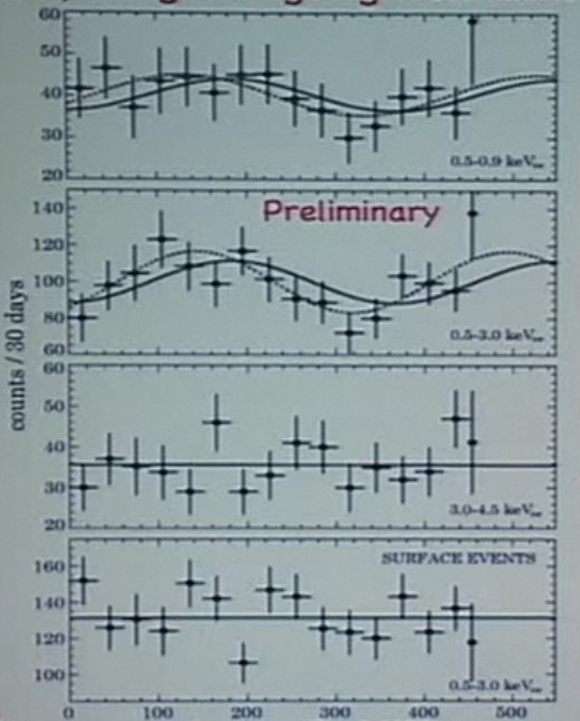 The black data points are from PAMELA, and the grey band is the Fermi measurement with their systematical uncertainties. The two are nicely consistent. So, we still don't know whether the positron excess is due to dark matter or pulsars or old newspapers, but at least we know for sure it is real. What a year... Previously I had to think hard to make up a blogging subject that would not be too boring. But these days there's hardly a week without a new discovery, a new rumor of a discovery, or a refutal of the previous week's rumor. This year the particle community was already electrified by the CDF forward-backward asymmetry, the CDF W+2j bump, the would-be Higgs decaying to photons in ATLAS, and now there is CoGeNT... The rumor that CoGeNT observes the annual modulation of the signal has been circulating for a while, but only recently it was officially announced, first at the APS April Meeting in Disneyland last Monday, and today at the symposium in STSI Baltimore. CoGeNT is a dark matter experiment located in the Soudan mine in Minesotta. In spite of a relatively small size and limited background rejection its germanium detector has certain advantages, e.g. a low threshold (0.4 keVee, corresponding to true recoil energy of about 2 keV) and a very good energy resolution. This makes it particularly sensitive to light GeV-scale dark matter whose scattering cannot produce nuclear recoils far above keV. CoGeNT was running continuously since December 2009 until March 2011 when the power was cut off due to a fire in the Soudan mine. 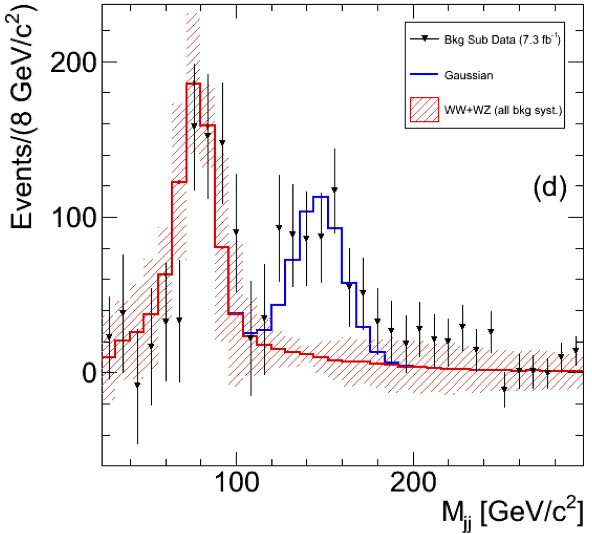 The new results based on 145 kg.day of data continue to show an excess of events at low recoil energies which can be interpreted as the scattering of light dark matter particles in the detector. The preferred parameter region has shrunk and now points to 7-8 GeV particle with the cross section on nucleons around 10-40 cm2. More importantly they were able to measure the annual modulation of the signal. 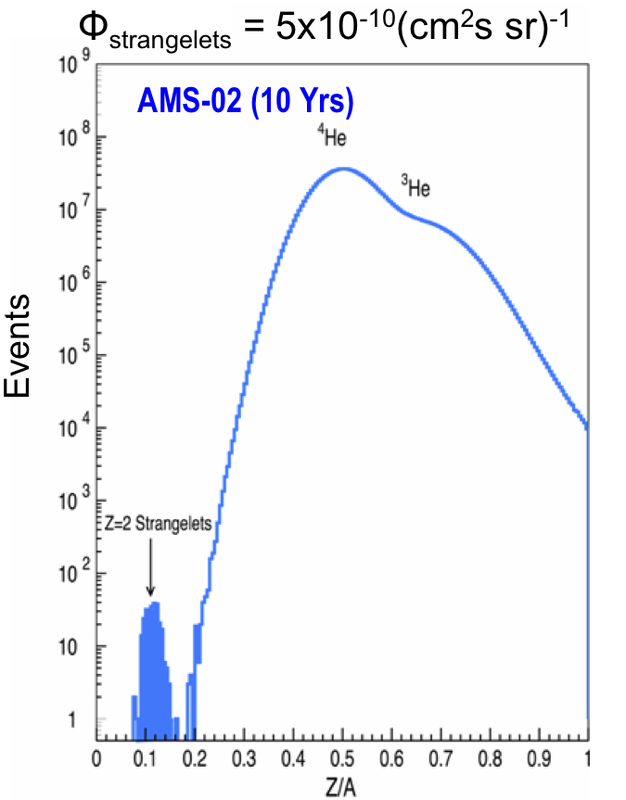 Because the velocity of the Earth with respect to the dark matter sea changes anually due to the orbital motion around the Sun, the event rate of dark matter scattering is expected to oscillate with a peak in June and a minimum in December. And here is what CoGeNT observes. 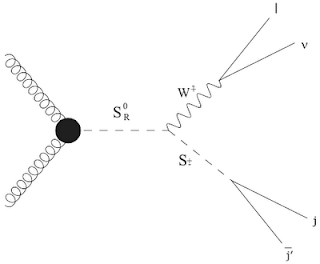 The solid line is the expectation from dark matter, and the dashed line is the best modulation fit to the signal. The phases of the two are within 1 sigma. CoGeNT estimates that the modulation hypothesis is preferred at 2.8 sigma. The modulation is most pronounced in the 0.5-2 keV region while it is absent for surface events. Well, I don't know what to think about it. The parameter region consistent with the CoGeNT signal is naively excluded by CDMS, Xenon10 and Xenon100. One would have to assume that these 3 experiments are terribly wrong about their energy scale in order to reconcile their limits with the CoGENT signal. Maybe CoGeNT is just wrong. On the other hand, the observed modulation is very intriguing, especially in combination with the long-standing DAMA modulation signal and the oxygen band excess in CRESST. On the third hand, maybe nobody is wrong, but dark matter is simply different than what we've expected it to be. Prepare for a new wave of dark papers on arXiv. The video of CoGeNT's presentation is here. See also this post on Cosmic Variance.